Whether you’re raising koi or thinking about taking the big dive into koi ownership, there are many things to consider when it comes to housing your fish. Koi grow quickly when fed correctly and need a lot of room to swim. Outdoor koi ponds are not only the most aesthetically pleasing way to house your fish, but their benefits greatly outnumber other options. However, with careful precaution, koi fish aquariums can be a possibility for temporarily housing baby koi. Here’s some tips on keeping koi in an aquarium! Koi can be kept in an aquarium until they are six inches long. After that, they’re just too big! First off, remember that aquariums are never a long-term option for koi. They simply need more room to move and grow. Aquariums are suitable for koi fish that are six inches and smaller. This is usually the case for koi that are under the age of two. Here’s a helpful guide to estimating an aquarium’s capacity in comparison to a koi’s size. 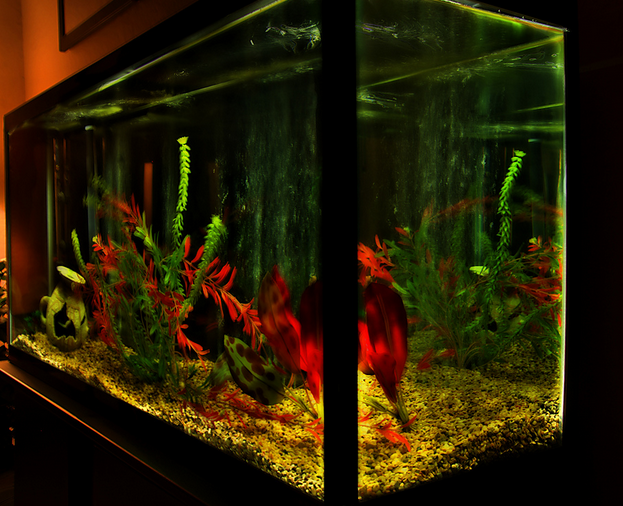 Before purchasing an aquarium, consider your options. You’ll want to buy the biggest tank you can afford that will fit in your home so your koi have plenty of room. Keep in mind that large tanks are very heavy, especially when filled with water. Make sure your flooring is strong; placing a tank over support beams is recommended. Your koi fish aquarium will also need a cover. Koi fish are known to jump and you do not want one ending up on the floor of your home, especially if you’re not around! Koi fish are jumpers and will flop out of the tank if not covered. Also consider the sunlight. Direct sunlight will cause more algae to grow within the aquarium and will affect water temperatures. It is better to place the aquarium out of the sun’s direct reach. Koi are also receptive to their surroundings, particularly with sound vibrations. Place them in a quiet part of the home to avoid unnecessary stressors in your koi’s life. It will keep them happier and healthier! Once you have your aquarium, give your koi a few inches of substrate at the base of the tank. These bottom-feeders will enjoy a mixture of gravel and rocks. And purchase a water heater to regulate the water temperature. Monitoring water levels in aquariums is all the more important in a concentrated setting. Keeping water levels safe for your koi are extra important when housing them in an aquarium. Because the water is more concentrated in the tank, koi will be susceptible to even the slightest of mistakes in the water. Buy a strong and high quality filter for cleaning the water too, as koi tend produce more waste than most aquarium pets. 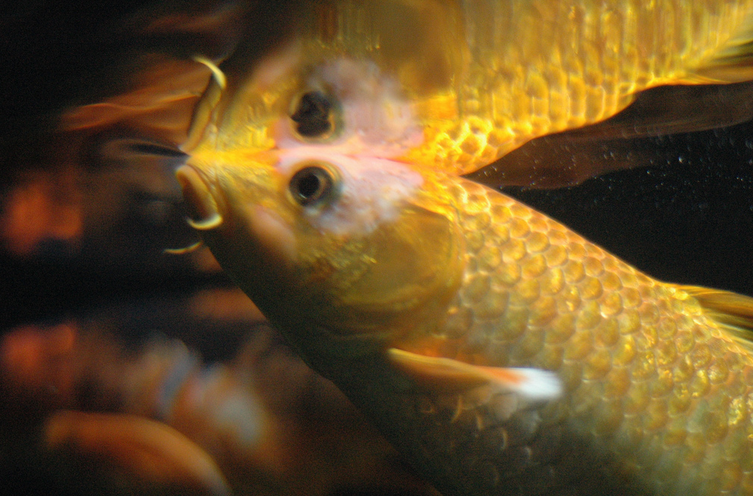 A good filter will keep the water clean and help your koi avoid potentially fatal diseases. Avoiding overfeeding will also prevent water pollution. So there you have it! Koi fish aquariums are a realistic solution to temporary housing for your young fish friends. Do you have a koi fish aquarium? Send us pictures via the contact form!